Kenneth Burt insightfully links the Latino movements of the thirties and the sixties, and brings to life a host of long-forgotten individuals and organizations. His work is replete with rich detail extracted from extensive personal interviews and original archival research. 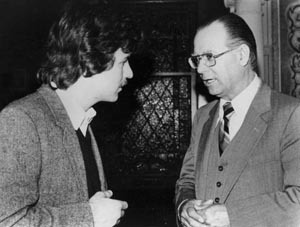 Kenneth Burt with California Supreme Court Justice Cruz Reynoso in the early 1980s. Burt has spent two decades interviewing historic figures in search of untold stories and political insights. 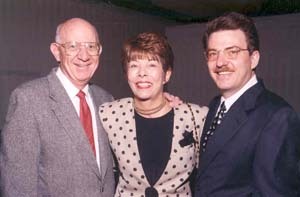 Burt with Harvey and Hope Mendoza Schechter. Hope was the first Mexican American ILGWU organizer in Los Angeles. Harvey directed the Anti-Defamation League in Los Angeles. History is the collection of stories that we place into a larger context to illuminate the past and, often, to provide insights into the present and future. Kenneth Burt, as a politically active high school student, served as one of the Sacramento Boycott Committee's delegates to the United Farm Workers' 1976 convention in Fresno. The convention feted Governor Jerry Brown and U.S. Senator Edward M. Kennedy, and honored Monsignor George Higgins and the United Auto Workers for their seminal contribution to la causa. This sparked an interest in linkages between organized labor, the faith community, and electoral politics. A developing interest in the Mexican American Political Association (MAPA), while an undergraduate at University of California at Berkeley, led Burt to became the group's historian. He sat in on meetings between MAPA and Governor Jerry Brown. Burt also traversed the state, interviewing veteran activists and elected officials such as Congressman Edward Roybal. MAPA published Burt's illustrated history in 1982. In 1984, Burt returned to California from Harvard University via the Southwest where he met with President Kennedy's Latino liaison, Carlos McCormick, and President Johnson's Latino liaison, Vicente Ximenes, along with American GI Forum's Founder, Dr. Hector Garcia. Over time he became increasingly interested in coalition politics, organized labor, and formerly Yiddish-speaking unions and cultural organizations, particularly in Los Angeles' Boyle Heights neighborhood. Burt was the principal source for a major Los Angeles Times story, "Common Threads, This Week's Yiddishkayt L.A. Festival Will Explore the Longtime, Complex Ties Between L.A.'s Latino and Jewish Communities That Many Say Might Determine the Shape of the City's Future" of October 21, 1999. Listening to "old timers," Burt developed a lifelong interest in the role of pragmatic idealists within the civic arena. This passion grew over the years he became a participant-observer, working for elected officials and representing educators within the electoral process. Burt also presents papers at academic conferences and publishing in a variety of anthologies, journals, and encyclopedias. Burt's book, The Search for a Civic Voice: California Latino Politics is now available on Amazon.com. See conference, seminar and workshop presentations.